OK – I am now hooked on the weekly travel theme from ‘Where’s my backpack?‘. This week’s travel theme is light, and it would have to be my favourite type of photographic setting. I love shooting at night with the artificial city lights. I love shooting sunsets with the sun fading. So the question was which ones would make the cut. These photos were taken in Australia, the United Kingdom, Canada, Greece, and the United States. I look forward to travelling more and capturing more photos of light. The first shot was a spectacular sunset captured in the NSW Hunter Valley. The sun lit up the clouds in all their glory – beautiful spot, and great wine too. This second shot was taken outside of my house when I lived in Manchester in the UK. It was the first time I had seen snow in England and I was giddy as a school kid (at 1am in the morning mind you). The night lights bathed the snow in a surreal golden colour. This third shot was taken inside the Notre Dame Basilica in Montreal, Canada. This part of the cathedral is in the rear, where the natural light descends gloriously down from the ceiling. The next shot was taken at the Vivid Festival of light in Sydney from 2011. The Sydney Opera House is hosting a pretty good canvas for the projected light. This shot is a weird one, and sorry to the vegetarians. My mother in-law got remarried a few years back and we celebrated the occasion outdoors under the moonlight with a spit roast. Once the sun set, the night was pretty much lit by the roast and moon – and the pig was delicious thanks to my brother in law. Sydney Harbour is constantly abuzz with boats and ferries, and at night their lights leave trails against the old coat hanger. I have quite a few of these in my type of shots in my collection. Sunset in the Greek Islands is an experience that I would recommend to anyone. Santorini, Crete, and Mykonos are all well known islands. But my favourite is Paros, and a calming sunset it is. The Vivid Festival offers up too many shots of Sydney all lit up. This next photo is of Customs House from the 2012 show, where this animation came to life. I can’t get away from sunsets. Here the Northen Midlands, United Kingdom, countryside is bathed in the light of the setting sun over the fields at English Frankton. The last shot was from my third trip to New York, USA. The Empire State Building always puts on a light show. 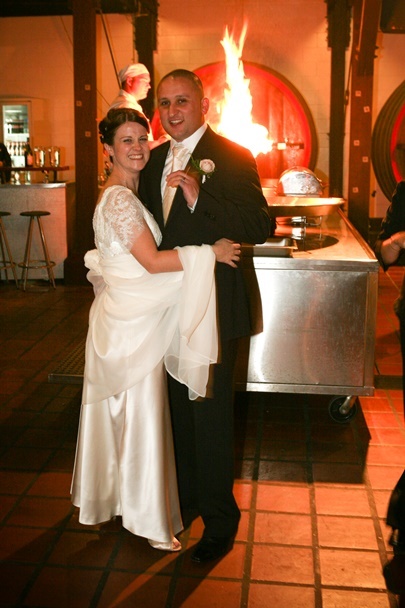 I have decided to add one other from our wedding where we had the chefs cook for all of us with large open flame pans in front of all the guests. Our photographer for the evening thought it would be a good idea to get a photo of us in front of the flame. It was a great night! (Thanks Alison for the photos).